"Behind every successful man there is a woman" is probably the least statement that can be made for Protul Chandra's wife Basanti Sorcar, who was instrumental not only in the building of her husband's career but also for her five children. Mrs. Sorcar, the daughter of Dr. Pramatha Nath Majumder, a renowned medical doctor of Mymensing (it lies in Bangladesh today) and later of Kolkata, India, never did appear on stage following the orthodox Hindu tradition. But her contribution behind the stage was the back bone of Sorcar's phenomenal success. In the early days of his career it was she who made the costumes, stitched the draperies and remained a constant source of inspiration throughout his life. While her husband was away for long tours with his elaborate magic shows, it was she who took care of the home, raised her five children and took them to school. "Education first" was the motto of the Sorcar family, and it was the mother who made sure it happened. Today Sorcar's five children are highly educated scholars, well established in their respective fields. Mrs. Sorcar passed away on December 26, 2009. All five children were instruments in their father's magic shows and took part in being an assistant on stage ever since they were very young. His eldest daughter, Ila, and second daughter, Geeta, were stage-assistants until they were in college. Ila, who is a scholar in Sanskrit and holds a Ph.D in it, is married to Ashok Palit, a high ranking officer with the Indian Administrative Service. Geeta, holder of a bachelor's degree in Arts and an accomplished sculptor and painter, is married to Partha Sarathi Chaudhuri, another high ranking officer with the Indian Administrative Service. Both of them currently reside with their families in Kolkata. Sorcar's three sons, too, are highly educated, well established in their respective careers, and were profoundly instrumental in the success of their father's magic shows. Like their sisters, all three brothers were assistants on stage in addition to being critics. His eldest son, Prafulla (well known as Manick Sorcar), is an artist, animator, engineer, and a Laserist. His interest both in science and art began, when, as a boy, he did lighting and art design for his father's world-touring shows. After getting a BSEE from IIT-BHU, he moved to the USA to pursue more on lighting technology, earned an MSEE from the Uni of Washington, and ran Sorcar Engineering firm doing lighting design for iconic projects such as the Denver Int'l Airport, Colo Convention Ctr, etc. Alongside, he carved out a niche for himself by creating a series of Indian animation that were telecast on PBS stations for 25 years and producing world-touring stage shows mixed with laser - all aimed to bring East to the West. He got global recognition by earning top awards at int'l film festivals, awards & honor from Int'l Laser Display Association (ILDA), and a Lifetime Achievement Award from his alma mater. Manick lives with his family in the USA. For more about Manick Sorcar, click here. 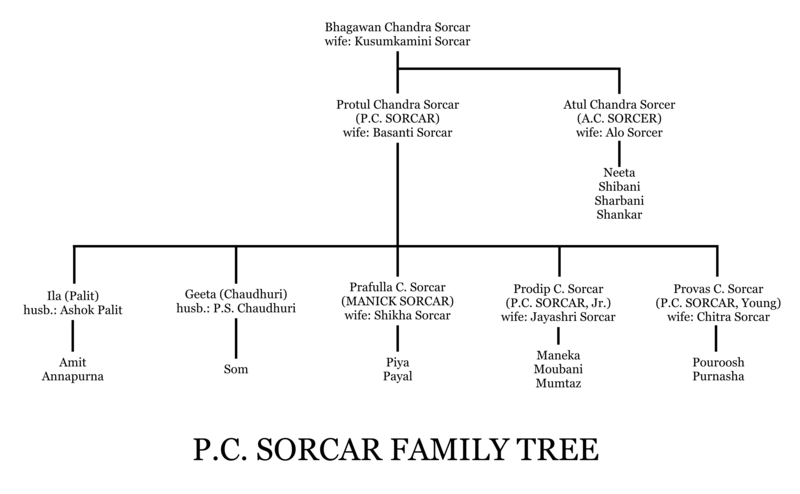 Sorcar's second son Prodip (well known as P.C. Sorcar, Jr.) took an early interest in performing magic and toured with his father in more occasions than the others. He was performing his own magic shows while he was still a college student and performed death-defying acts such as escaping from a locked box under ocean. After his father's untimely death in Japan, he flew there to continue his father's "Indrajal" show and has been an independent, highly successful magician ever since. Sorcar performs with his magician daughter, Maneka, and his performances have included the "disappearance" of the Taj Mahal and the Indore-Amritsar Express of India among others. In 1998 he received the Merlin Award in magic. In 1989 he produced and acted in a children's movie named 'Gili Gili Ge'. Prodip holds a doctoral degree in psychology from Calcutta University and lives with his family in Kolkata, India. For more about P. C. Sorcar, Jr., click here. Like his older brother, Sorcar's third son, Provas, (well known as P.C. Sorcar, Young) is also an independent, highly successful magician following the footsteps of his father. Like his other siblings, Provas contributed significantly in his father's shows by being a key assistant on stage. After his father's death, he continued carrying on magic shows with the same title, "Indrajal". Sorcar performs with his magician son Pourush on stage. In addition to being a skillful magician, Provas is also an accomplished Indian classical ballet dancer, who composed a ballet on the life of Emperor Ashoka called Rhythm of 262 BC in 1982. He is an aviator - having obtained both private and commercial pilot's license from the Director General of Civil Aviation, Government of India. Provas holds a master's degree in applied mathematics from Calcutta University and lives with his family in Kolkata, India. For more about P. C. Sorcar, Young, click here.